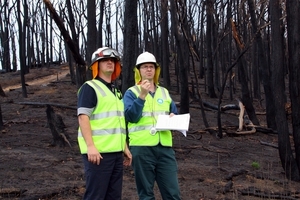 CSIRO is a participating agency in the Bushfire Cooperative Research Centre which has been looking at the key issues in the February 2009 bushfires. The CRC’s Bushfire Research Task Force includes researchers from various state fire agencies and research organisations with expertise in building analysis, human behaviour, community education, bushfire behaviour, fire weather, and fire investigation. The purpose of the research is to provide fire and land management agencies with independent analyses of the factors surrounding the Victorian fires. Photographer : Robert Kerton on June 10 2009.